Lauren Tibbets poses for a photo. Tibbets won the Butler Fall Invitational for the second time in her career. Photo by Mason Lovett. The Butler men’s and women’s golf teams both finished first in the Butler Fall Invitational. There were six teams competing for the men’s title and ten competing for the women’s. 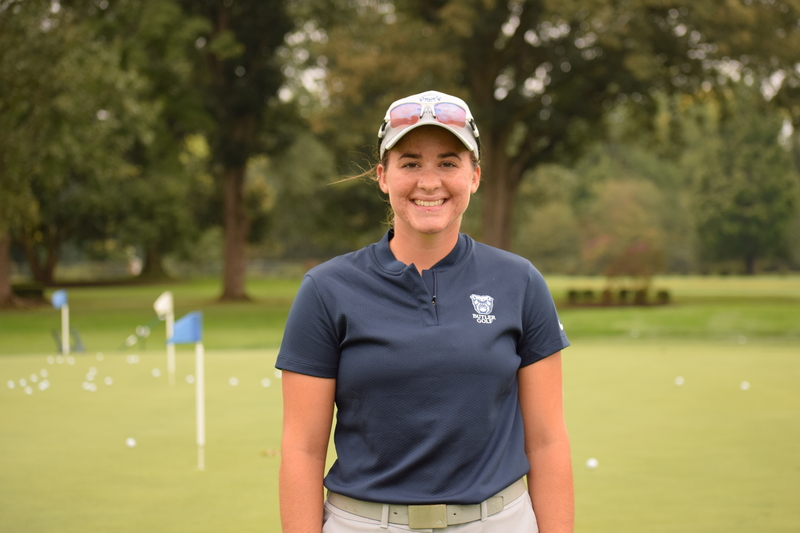 The women’s golf team was lead by senior Lauren Tibbets, who won the invitational for the second time in her collegiate career. Her first victory came as a freshman in 2015. Tibbets shot a 69 (-1) in her final round on Tuesday. In her first round, Tibbets carded a 72 (+2), finishing at 141 (+1) to clinch the victory. Sophomore Ally Ross was the second-best Bulldog, tying for tenth with rounds of 78 and 79 for a total of 157 (+17). The Butler men’s golf team was lead by junior Patrick Allgeier. Allgeier finished second with a two-under 208. He shot 66 and 69 in his first two rounds, respectively, on Monday. Allgeier carded a 73 on Tuesday. Michael Cascino finished in a tie for third with a score of 210 for the event. Logan Sabins finished just behind Cascino at 211 to finish fifth. The women’s golf team returns to action Oct. 5 at the Yale Invitational. The men’s golf team will compete next at the Georgetown Invitational on Oct. 15.